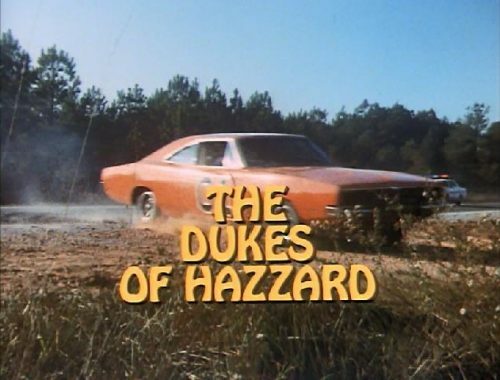 The Dukes of Hazzard first aired on CBS television on Friday January 26, 1979. It was originally intended to be a mid-season filler for Captain America, with only nine episodes planned for broadcast. The majority of shooting took place in and around Covington, Conyers, and Atlanta, Georgia. Warner Brothers executives took a liking to the show and, due to its popularity with viewers, realized it had potential to become a full-time series. Overall, 147 episodes over seven seasons were filmed. Here’s ten things we bet you didn’t know about The Dukes of Hazzard. The Dukes of Hazzard is based on the movie Moonrunners. This 1975 film is about the exploits of a Southern family that make moonshine whiskey for a living. The movie is also narrated by Waylon Jennings, has characters named Uncle Jessie and Sheriff Rosco Coltrane, and features the Boars Nest in the movie’s opening. Don’t look for Hazzard County on a Georgia map. You won’t find it. It simply does not exist. John Schneider, Tom Wopat, and Catherine Bach are not native Georgians. John is from New York state, Tom is from Wisconsin, and Catherine hails from Ohio. When John Schneider auditioned for the role of Bo Duke, he lied about his age. He said he was 24 years old, but was actually 18. In order to look the part, he drove to the audition in a pickup truck, dressed in a tattered Bud Man t-shirt, and had a six-pack of Pabst Blue Ribbon beer in his hand. Schneider also stated that he was from Snellville, Georgia. Ben Johnson (Cooter) left the show for a short time over a dispute about his character’s beard. Ben wanted Cooter to have a beard but the producers wanted Cooter to be clean-shaven. Only the first five episodes of season one were filmed in Georgia. Shooting then moved to the Warner Brothers Burbank Studios in Burbank, California and Walt Disney’s Golden Oak Ranch in Newhall, California. Deputy Sheriff Enos Strate (Sonny Shroyer) starred in a Dukes spinoff called Enos. Unfortunately, the show flopped after only one season. Shroyer returned to The Dukes of Hazzard in season five. Shroyer was smart to have it written in his contract that if the show failed, he could return to The Dukes of Hazzard. While filming in Georgia, the show’s directors were having lunch when someone drove by and blew their horn that played the first few bars of “Dixie”. The directors chased down the driver and gave him $300 for the horn. It’s been part of the General Lee ever since. CBS network chairman William Paley was not a fan of the show. When asked about The Dukes of Hazzard, he would declare that the show was lousy and somewhat uncultured for his taste. Ben Jones, Sonny Schroyer, and John Schneider were all extras in the movie Smokey and the Bandit. Few shows have had the lasting appeal as The Dukes of Hazzard. Even after 40 years, the show still has a legion of diehard fans that continue to watch the show. Its family-friendly themes and good ol’ boy humor are just a couple reasons why the show continues to thrive today.